For the modifier key featured on most compact keyboard layouts, see Fn key. BBC Micro: red/orange keys F0 to F9 in a horizontal row above the number keys on top of the computer/keyboard. The break, arrow, and copy keys could function as F10–F15. The case included a transparent plastic strip above them to hold a function key reference card. IBM PC AT and PS/2 keyboard: F1 to F12 usually in three 4-key groups across the top of the keyboard. The original IBM PC and PC XT keyboards had function keys F1 through F10, in two adjacent vertical columns on the left hand side; F1|F2, F3|F4, ..., F9|F10, ascending downwards. Some IBM compatible keyboards, e.g., the Northgate OmniKey/102, also featured function keys on the left, which on examples with swapped left Alt and Caps Lock keys, facilitate fingers of a single hand simultaneously striking modifier key(s) and function keys swiftly and comfortably by touch even by those with small hands. Many modern PC keyboards also include specialized keys for multimedia and operating system functions. VT100 terminals: four function keys (PF1, Alt key[dubious – discuss]; PF2, help; PF3, menu; PF4, escape to shell) above the numeric keypad. In the classic Mac OS, the function keys could be configured by the user, with the Function Keys control panel, to start a program or run an AppleScript. macOS assigns default functionality to F9, F10, and F11 (Mission Control); F12 (Dashboard); and F14/F15 (decrease/increase contrast). On newer[when?] Apple laptops, all the function keys are assigned basic actions such as volume control, brightness control, NumLock (since the laptops lack a keypad), and ejection of disks. Software functions can be used by holding down the Fn key while pressing the appropriate function key, and this scheme can be reversed by changing the macOS system preferences. Under MS-DOS, individual programs could decide what each function key meant to them, and the command line had its own actions (e.g., F3 copied to the current command prompt words from the previous command). Following the IBM Common User Access guidelines, the F1 key gradually became universally associated with Help in most early Windows programs. To this day, Microsoft Office programs running in Windows list F1 as the key for Help in the Help menu. Internet Explorer in Windows does not list this keystroke in the help menu, but still responds with a help window. F3 is commonly used to activate a search function in applications, often cycling through results on successive presses of the key. ⇧ Shift+F3 is often used to search backwards. Some applications such as Visual Studio support Control+F3 as a means of searching for the currently highlighted text elsewhere in a document. F5 is also commonly used as a reload key in many web browsers and other applications, while F11 activates the full screen/kiosk mode on most browsers. Under the Windows environment, Alt+F4 is commonly used to quit an application; Ctrl+F4 will often close a portion of the application, such as a document or tab. F10 generally activates the menu bar, while ⇧ Shift+F10 activates a context menu. F2 is used in many Windows applications such as Windows Explorer, Excel, Visual Studio and other programs to access file or cell edit functions. During Microsoft Windows 10 startup, ⇧ Shift + F8 is used to enter safe mode; in legacy versions of Windows the F8 key was used alone. ^ "Definition of FUNCTION KEY". www.merriam-webster.com. 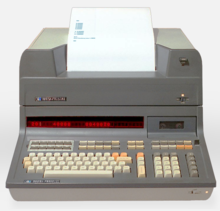 ^ The completely new 2201 FLEXOWRITER automatic writing machine by Friden (advertisement), Nation's Business, Vol. 53, No. 2 (February 1965), pages 75-76. ^ a b "OLD-COMPUTERS.COM : The Museum". www.old-computers.com. ^ a b Ahl, David H. "NEC PC-8800 personal computer system". www.atarimagazines.com. ^ Ignite-UX Administration Guide: for HP-UX 11.00 and 11i, Appendix D (Terminal Keyboard Shortcuts), Advanced Keyboard Navigation. Wikimedia Commons has media related to Function keys.